To check which eye is dominant follow the instructions below. 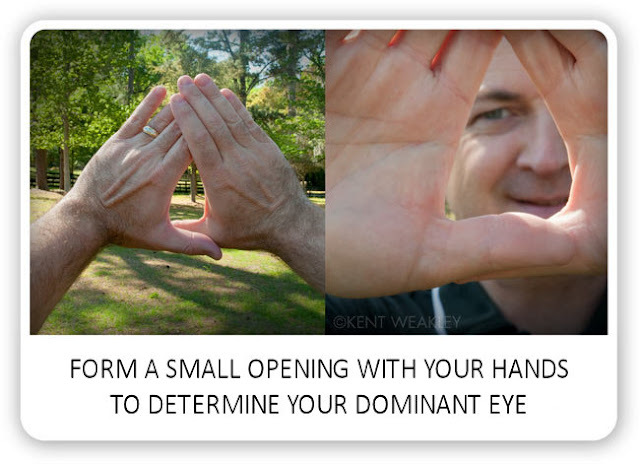 Form your hands into a small triangle shape and using both eyes line up an object in the distance by looking through the tiny triangle in the middle. Don't move your hands during the next part. Close one eye and then vice versa close the other eye to see which eye is more accurate and can see the object. The more accurate one which can see the object is your dominant eye. This technique is also used by photographers sometimes. Another way to do this test is to hold up a CD or DVD instead of using your hands and go through the steps the same way, but using a CD or DVD is unnecessary since you can easily do it with your hands instead. Hi..what a nice blog expressing the latest exercise skills to stay healthy & fit. Really this is very much interesting because of sports.